SpaceX’s Falcon 9 v.1.1 rocket is currently being realigned for a Thanksgiving launch attempt on Thursday, following its scrub on Monday. Three attempts were made inside the 66 minute window to launch the SES-8 satellite from SLC-40 at Cape Canaveral, in what is SpaceX’s debut of the upgraded rocket from their Florida base. Monday’s attempt was issue-free throughout the bulk of the countdown, including key items such as the loading of RP-and LOX into the vehicle – both of which were completed at around 8pm UTC. The countdown continued to proceed towards the initial T-0 at the opening of the window, prior to a hold being called at T-13 minutes, ahead of polling for the terminal count. The first hold was called after a first stage LOX tankage vent/pressure relief valve failed to command to “close” properly, impacting on the ability to pressurize the tank to required flight levels, per L2 information providing additional insight into the three holds. With controllers recycling the countdown to the pre-determined point that allowed for a re-polling of the team to enter the terminal count, a second hold was called by the launch sequencer, following an “out of family” voltage reading on an electrical power supply on a ground system. The launch team evaluated that the reading was acceptable to press towards launch, mitigating a repeat hold by relaxing a parameter in the sequencer software. With the countdown recycled for a T-0 of 23:30 UTC, one final attempt was allowable within the available launch window. However, despite the count proceeding into the terminal count, an issue with the first stage LOX pressurization system – again specific to the vent valve on the first stage – resulted in another hold just under four minutes to launch. “We observed unexpected readings with the first stage liquid oxygen system so we decided to investigate,” noted SpaceX in a statement. SpaceX CEO and Chief Designer Elon Musk added the team saw pressure fluctuations on Falcon boost stage liquid oxygen tank, and that they wanted to be “super careful” via a comment on his Twitter account. Other issues noted including the premature release of the Environmental Control System (ECS) duct line between the rocket and the erector. This is understood to have occurred when the erector was commanded to move away from the vehicle ahead of launch, with the ECS duct pulled loose from the payload shroud by a suspension cable that had become entangled. This was not an issue for the SES-8 satellite’s health and would not have stopped the countdown. Additionally, after the scrub was called, the erector failed to return to its position alongside the vehicle. 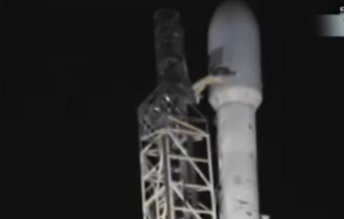 Engineers resolved the issue later on Monday night, allowing for the completion of detanking and the lowering of the Falcon 9 v1.1 to its horizontal position. Issues with the erector should not come as a surprise, given this is a new piece of heavy launch pad hardware that mirrors the new erector at SpaceX’s Californian launch site at SLC-4. The Californian erector has been designed to host both the upgraded Falcon 9 and the three-core Falcon Heavy, the latter set to debut from California in 2014. 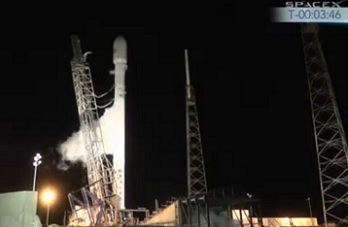 The Florida version is specific to just the upgraded Falcon 9. With the vehicle now noted as being in the horizontal position at SLC-40, the SpaceX team now have the option of replacing the LOX vent valve on the first stage if they determine that work is required, with current status showing they remain on target to be back into a launch posture for a Thanksgiving Thursday launch attempt. (Logo in honor of the Falcon 9’s new launch day). “The launch vehicle and satellite are in great shape and we are looking forward to the next launch opportunity on Thursday at 5:38 p.m. Eastern time,” added SpaceX’s scrub statement on Monday. In the event of a further delay, it was initially understood the following opportunity to launch may be pushed to Monday, based on the various constraints surrounding Thanksgiving, reasons both Tuesday and Wednesday were not available to SpaceX. 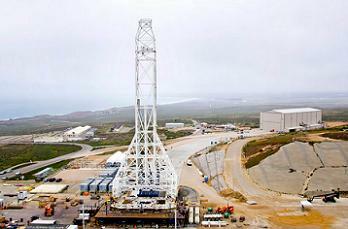 However, SpaceX managed to negotiate another launch opportunity on Friday, should they need it. (Click here: http://www.nasaspaceflight.com/l2/ – to view how you can support NSF’s running costs and access the best space flight content on the entire internet in reward of your support).